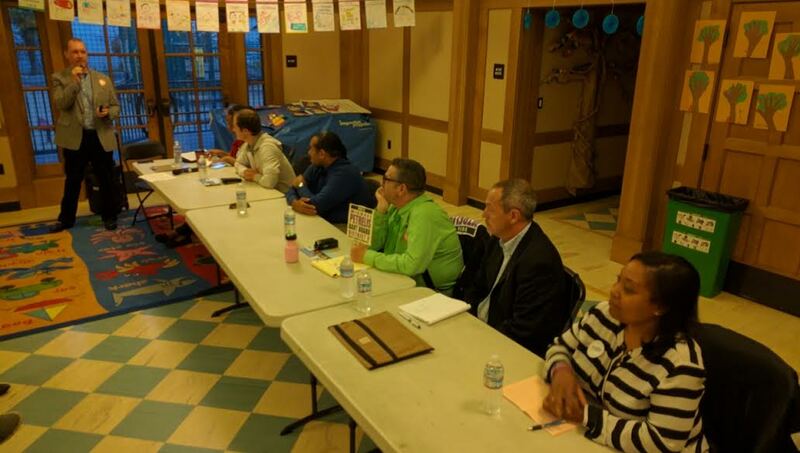 The SF Transit Riders’ Brian Stokle moderated a discussion among BART board candidates for District 9 and 7. Photo: Streetsblog. 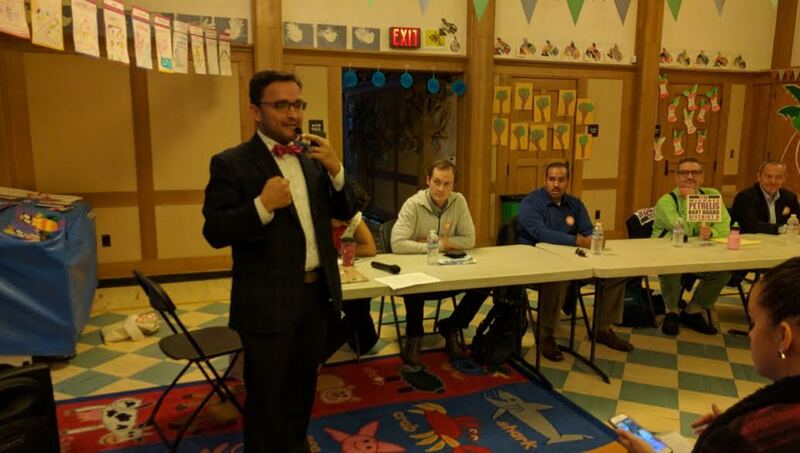 Yesterday evening, the San Francisco Transit Riders held a “BART Board Director Candidate Forum” at the Mission Pool & Playground Clubhouse in the Mission District. We are hosting the forum for the candidates to introduce themselves and respond to SFTR and public questions. This is an important time in BART’s history. Its aging system is facing the challenges of ever more crowded trains. With these BART Board elections and the $3.5 billion BART bond to improve safety and increase train reliability on the same ballot, there are many issues to discuss at the forum. Thea Selby, chairwoman of the SF Transit Riders, spoke with Streetsblog prior to the event. She explained that the forum was intended to help educate the voters about what each candidate stood for, without her organization taking sides. “To my knowledge this is the only educational forum,” she said. It was also part of “Transit Week,” a push by the advocacy group to change perceptions of riding the bus as something people only do when they don’t have a better alternative. “We want to remind transit riders they can be proud of producing less congestion and pollution and helping San Francisco meet its climate change goals,” she said. Meanwhile, Will Roscoe and Lateefah Simon were there running for the District 7 seat against incumbent Zakhary Mallett. D7 encompasses parts of Alameda, Contra Costa, and San Francisco. Roland Emerson, another candidate for D7, was unable to attend. Selby and Supervisor David Campos made introductory remarks. Campos stressed that transportation infrastructure is integral to people’s lives and the Bay Area economy, but it rarely gets the focus it deserves. “BART caries 440,000 people per day. It’s the fifth largest heavy rail system in the country,” he said, adding that the entire region will falter if BART is neglected. He described his own commute; often he can’t squeeze onto a train for his ride to City Hall. “That situation is only going to get worse. We need to talk about a second tube,” he said. Brian Stokle of the Transit Riders introduced the candidates and kicked off the debate by asking each one to give an opening statement. Borden, in the far right of the above photo, spoke first. “I’m running for this Board because transportation is the lifeblood of this community,” she said, citing her past work for the Chamber of Commerce as a qualification. “It is vital to our economy.” She said that BART is faltering and having breakdowns because of a lack of focus. “[We must] shore up core infrastructure,” she said, ruling out extensions that “do not prioritize our housing needs.” She also stressed the importance of the upcoming Measure RR–the $3.5 billion bond measure that will go to repairing and updating BART’s rail, signal, and electrical systems. “Steve Glazer in Contra Costa County wants it to fail. We can’t let it,” she said. Bevan Dufty, the former San Francisco Supervisor for District 8, spoke about the work he did to improve Muni and how those lessons will apply to BART. “J-Church riders used to phone me whenever the J was late; people would let me know about forty-minute delays, so I would call Muni and ask questions about it and I kept getting different answers,” he said. Eventually, he asked the city controller’s office to audit Muni. “It led to the ‘Transit Effectiveness Project,’ which was the first time Muni looked for patterns of problems. I can focus on the nuts-and-bolts of a smaller problem and look at the bigger solution.” And that bigger solution, he said, became apparent when the controllers at West Portal station asked him to look at their equipment–he said it looked like something out of a Flash Gordon serial. They were still using electronics with vacuum tubes and other out-of-date parts that were prone to failures, unable to handle Muni’s modern demands, and too difficult to fix. “I spent the next three years to get it rebuilt,” he said. Zakharry Mallet, the one incumbent on the panel, said he “took a passion for transit at an early age; grew up as a foster youth [who took transit everywhere] but it didn’t work for me. It took forever to get anywhere. And I wanted to figure out how to make it competitive with the automobile,” he said. Mallet, who has a Masters of City Planning with a Transportation Planning emphasis from the University of California, Berkeley, was first elected to the BART board in 2012, “the youngest person to ever be elected as a BART Director.” His priorities, he added, were also nuts-and-bolts oriented. “BART is at its lowest point because of uncleanliness and overcrowding. But many of my colleagues have put money towards public art in the BART system. But art can’t prosper when the environment is so filthy. Make BART safe, clean, and reliable. First things first,” he said. Only one candidate seemed to pour some cold water on the upcoming BART bond. That was Will Roscoe, a civil engineer. “I dug into ridership data. I was hoping to find a trend or plan that would get us in twenty years to an awesome transit system. Instead I found a plan for a BART bond to have the same system we have now, with the same schedule and problems… and property owners will have thirty years of debt to repay.” Roscoe sees a greater roll for automated cars and new technologies in BART’s future. “There’s massive innovation going on thanks to self-driving technology. Electric cars now cost less than gasoline engines; ride-share is operating on a global scale. If BART wants to survive it needs to have someone on the Board to create or at least aspire to create awesome transit,” he said. 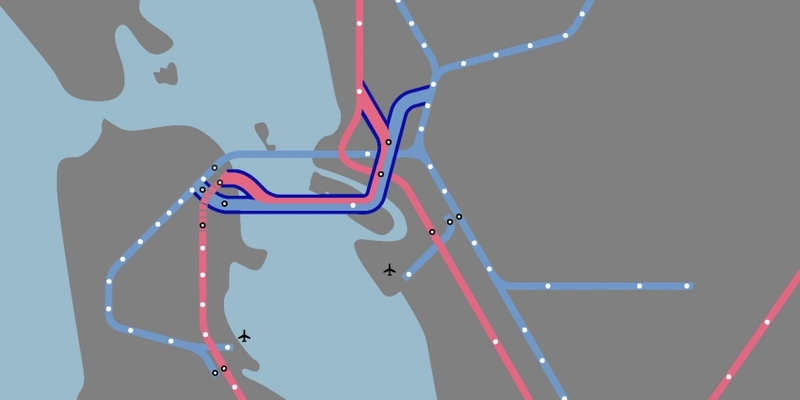 Candidates had different views on the dream of a second BART tube. Image: SPUR. Overall, the forum was a great venue for hearing the different perspectives of the candidates. Some were focused on equity, economics, or the nuts-and-bolts, but all the candidates had a good grip on the issues. Streetsblog did, however, take exception to Roscoe’s notion that BART trains are old technology that could be replaced by personal transit, driverless cars, and the sharing economy. See his driverless-car “AutoBART” concept for more on his thoughts. That said, Streetsblog readers have a wide range of qualified candidates to vote for. Meanwhile, for a great breakdown of the candidates for the BART Board, and other offices, check out the Bicycle Coalition’s growing candidate summaries. Supervisor David Campos helped kick off the forum. Photo: Streetsblog. So this the group that is going to bring a dysfunctional BART system back into favor? Is BART out of favor? My understanding is that average daily ridership is up almost 50% vs 2010. BART is over capacity, and BART is out of favor by the majority of users and non users. It’s the corpse of what it used to be. But hey, the jobs pay well and I hear the retirement plan is fabulous. Usage and being in favor are not the same thing. Citation for BART being “out of favor by the majority of users and non-users” please? Keyboard warriors don’t count. 880 is also over capacity. Is Caltrans the corpse of what it used to be? Are you in denial, or simply being contrary? A fresh citation for you will be available Nov 8th. Hang tight. What is this strange proposal that tech companies should pay a special tax for being near BART? Not all employers near BART, just tech companies. We need to stop pretending tech companies are the scapegoat of decades of bad planning and lack of decision making by public leaders to support growth. Jame, it is only Petrelis who wants to tax tech companies in this way. and he is the perennial fringe/joke candidate who usually gets less votes than “spoilt ballots” and write-in’s. Here are the facts from the SF Elections site. In 2014 when I ran for District 8 Supervisor, I came in second. I received 2,004 votes which came to 6.8%. Thank you, Roger, for attending the forum and reporting on it. Your inclusion of facts and quotes is greatly appreciated. Let’s hope there are more forums focused on the BART director races. How’d your D11 write-in campaign go this year? So you think BART’s day is past? What would you have replace it? Surely you’re not waiting for Elon Musk to put hyperloops throughout the Bay Area? I’d be thrilled with bi-level Rotem cars running on ex-Bart right of way. Yes, they are 5.5 feet taller, and would be the type of next gen system the Bay Area needs. You would like Caltrain to replace BART, rather than BART replace Caltrain? That’s a limited choice. We deserve a successor agency to mange and operate modern transit system in the Bay Area. One without the baggage and archaic structure of BART. Let’s not throw good money at a system that’s unsustainable in current configuration. Private vs public is the primary concern t be resolved. I meant that you appeared to want service along BART lines to be more the commuter railroad it always claimed to be, rather than the subway that most people believe it is. As for a regional transit agency, that is a bigger problem to be tackled as over a dozen different agencies with different purposes and funding have fought over turf for years. But is it really BART’s fault that it cannot be all things to all people? Some want it to be an urban subway system, some want it to be a commuter railroad, some want it to be a higher-speed rail link to the further-out Bay Area suburbs and townships. So inevitably we get something that gives everyone just part of what they want. Fantasies about rebuilding from ground-up along the BART ROW is fanciful and not helpful. We should accept the flawed BART and CalTrain systems as non-negotiable legacy systems and build a new system in parallel. Assuming, that is, that the voters agree to pay for it and wouldn’t prefer just to drive. They say a good negation ends with something all sides can live with, rather than with one winner and a possibly sore loser. Hope we can have that with the BART bond. But if people vote to drive, it will cost more in the long run with more and bigger highways.